Why replace that expensive multi-piece tank cover in the event of a crash? 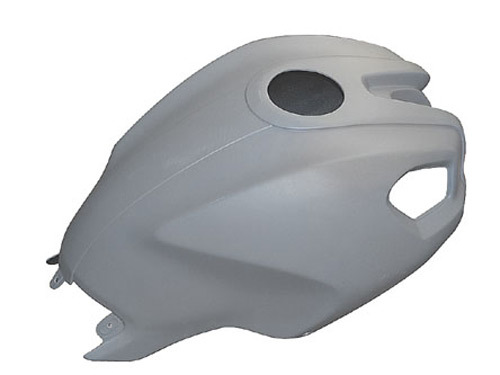 Armour Bodies Monster tank cover eliminates the stock multi-piece design and replaces it with seamless, light weight fiberglass for a fraction of the cost. This cover is a direct OEM replacement utilizing the intake screens and stock mounting points. Made from full sheet fiberglass with carbon/Kevlar reinforced mounting areas this piece is designed to be tough. As with any Armour Bodies piece, this cover comes finished in a high quality urethane primer that is ready to paint with a light scuff.